ND Brown Ltd is leading the way in the Rental market by designing a ‘Safe Access Zone’ which is fitted to our new 18 Tonne Insulated Tippers. The available tipper body volume has not been deminished as we use the longer wheel base variants. 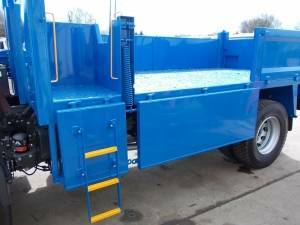 The access configuration comes with 3 points of contact all clearly defined and a safe zone to climb into before stepping into the tipper body. This is fitted to the Near Side of our latest 18 Tonne Tippers. To the Off Side we have created a clean area / sign storage area. Spring Assist to drop sides. 1200mm twin beacon bar to cab roof. Rear tailboard chute doors operated by levers so the user stands to the side of the discharge area.